The University of Southampton’s graduating class of 2017 featured one graduate who has her future goals firmly in sight. 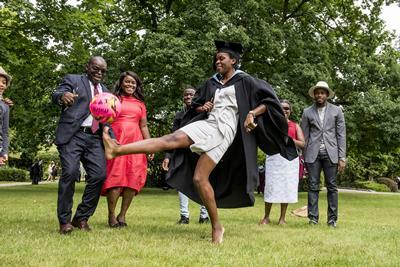 Ini-Abasi Umotong achieved First Class Honours in Economics after splitting her time between the classroom and the football pitch. As a student, Ini scored over 50 goals whilst playing for Portsmouth FC, earning her first international cap for Nigeria. Last season, as a member of Oxford United, Ini won the Golden Boot in FA Women’s Premier League 2 as top scorer and was named the league’s Players’ Player of the season. For the coming season, she’ll be playing for Brighton and Hove Albion. Born in Calabar, Nigeria, Ini moved with her family to Birmingham in the UK as a one-year old. Her football talent began to emerge early and by the age of five, she was scouted by Birmingham City’s Center of Excellence. Her first international cap came in 2015 in an All-Africa Games qualifying match versus Mali. Later that year she was a member of the Nigerian national squad playing at the Women’s World Cup in Canada.